Gather and entertain under the Palermo 3000 Garden Gazebo. 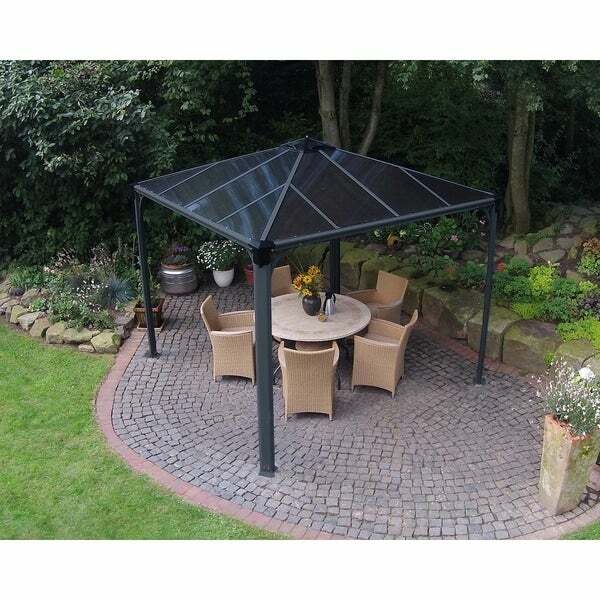 Enjoy your outdoor living space with this sturdy, durably constructed shaded privacy structure. High quality, powder-coated anthracite aluminum structure, galvanized steel connectors and virtually unbreakable twin-wall polycarbonate roof panels make up the incredible built-to-last framework. It's perfect for your BBQ grill, over your outdoor leisure spa, as well as for any type of exterior use for you to enjoy the outdoors! Hi, Net weight: 130.1 lbs. Gross weight: 145.5 lbs. Thanks and have a wonderful day! "can I keep this product up during winter and snow time"
Hi, Yes, you can. Thanks and have a wonderful day! "can I leave this product up during the winter and snow"